It’s that time of year again! March Madness is here! And if you have no idea what that is, I pity you, but let me help you. March Madness is the three weeks that college basketball plays out its championship tournament. 68 teams are selected to compete in a bracket, getting us down to the Final Four, and eventually the national champion. 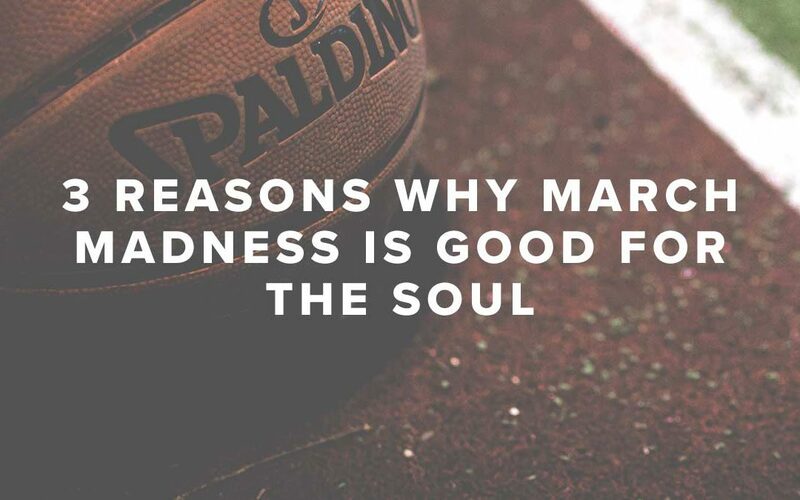 But this is more than just a “bunch of basketball games on tv.” Allow me to share the three reasons why it can be good for the soul. March Madness is the one sporting event that everyone can participate in regardless of your knowledge of the teams or even the sport. Filling out a bracket on Monday is a national event. Offices have pools, neighborhoods have competitions, and families complete their brackets for bragging rights. My entire family fills out a bracket – it’s a rule in our home. And even though I’m the only one who knows anything about this stuff, I don’t always win. But together it’s fun to highlight who wins, fill in brackets and cheer for the teams we’ve picked. College basketball is one of the few sports on during the day. There’s nothing like watching an 18-year-old kid win or lose a game to take your mind off all the stress on you at work! Something about seeing the pressure on teams to carry their fans’ hopes and dreams is exciting when they win and, even though disheartening when they lose, you feel this sense of – oh well, life is bigger than that. Odds are there will be high drama buzzer beater shots. In one moment you can go from the agony of defeat to the thrill of victory. Watching shots go in from half court or with only 2.1 seconds left (still mad at you Christian Laetner) is the drama you can’t script. This is true reality television. So fill out a bracket and follow along. Don’t know anything about the teams? Pick by colors or flipping a coin or best mascot… just have fun. And let it sooth your soul. And take solace in this: in a month baseball will be back! Join my mailing list to receive weekly emails about living better together and making life simple. ©2017 Pastor Rusty George | All Rights Reserved.